There was little to find fault with on the first night of Taylor Swift's Croke Park concerts on Friday evening. The girl knows what she's doing - and the multi-generational crowd in attendance to witness the Ready For It star in action suggests that's a widely held belief. 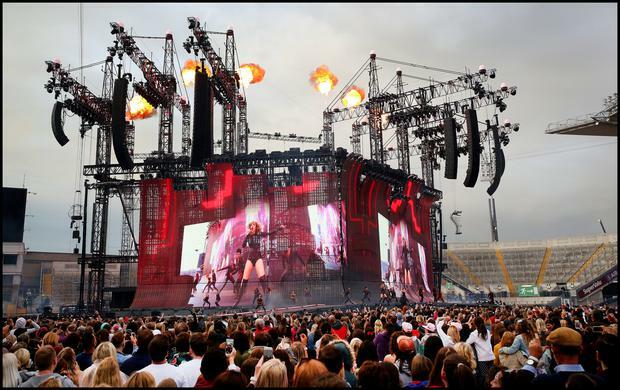 As almost 68,000 fans flocked to Croker to last night, and up to another 68,000 are expected tonight, it seems Swift will remain a firm favourite with young and old alike after her stop in Ireland on the European leg of the Reputations tour. Why? She simply had it all. There were fireworks and fireballs, there were daring dance routines, snappy costume changes, and she even took a leaf out of the Westlife guidebook on how to play Croke Park by flying across the crowd not once but twice during the night. Taylor has a bit of a, dare we say, reputation for dramatics and, living up to it on the night, she kept fans anticipating her performance for just over half-an-hour, filling time by playing a behind-the-scenes trailer for her video Look What You Made Me Do. As the moment for Taylor to emerge on stage edged closer, the negative press that has supposedly contributed to dragging her name in the dirt reverberated around the stadium, and fans got a sense that Taylor was about to go to town on anyone who had ever crossed her. While this could have been interpreted as a bit of a diva attitude - she isn't doing too badly for herself after all - the show hit all the right notes when it came to conveying her good girl gone bad transition. Taylor thanked the “beautiful, passionate Irish crowd” when she finally appeared on stage in a hooded glitzy leotard before singing punchy number Ready for It. “Thank you from the bottom of my heart, this is a really important night of my life. I’ve always heard Croke Park is legendary," she said, to the delight of the crowd. From the get go, she put on a spectacle. There was enough nostalgia to keep any old-school Swifties happy, with a mash-up of Bad Blood from her 1989 album and Should’ve Said No which harkened all the way back to her golden-haired, guitar playing days with the original Taylor Swift album and proved to be a massive hit with the crowd. The concept of her new tour of course is all about this 'new' Taylor, an emboldened and embattled woman who has matured and learned from the fame experience, who has left the sweet country girl version of herself behind. Sometimes those two personalities were at odds on stage - the giant inflatable snakes towering threateningly above her while she sang the happy-go-lucky Shake It Off were a bit out of place, and a heavily rehearsed monologue between songs at times had one thinking Taylor Script rather than Taylor Swift – but ultimately, the show packed a punch. There is no denying this star’s suitability to a stadium tour. She didn’t lose puff once, and the band and backing dancers were second to none. She even managed to strip it back to basics and play a few tunes on the piano without losing any momentum. And her support acts Charlie XCX and Camila Cabello complimented the show perfectly. We think it’s safe to say this was a concert that left Taylor’s reputation firmly intact.